Interviews – Scroll Down!, Race Videos Soon! 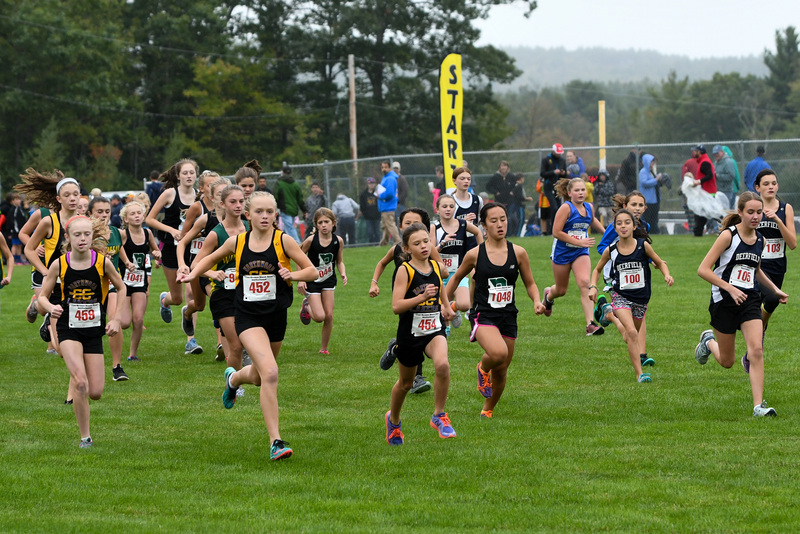 On a cool, misting fall day for racing, competition was heated at the 2016 Black Bear Invitational, which features a true, rolling cross country course for middle school, junior varsity and varsity races. The middle schools kicked things off with Northwood School sweeping the team titles. On the girls side, Addison Cox (1st, 11:56), Mary Joy (2nd, 13:05) and Libby White (3rd, 13:20) led the Lakers to a 21 point victory over Boynton Middle School, who had a 13 second pack time between Emily Pare, Amelia Smith, Maya Callahan, Victoria Smith and Audrey Gibson!!! A vastly improved Strafford School was 3rd, a mere 3 points out of second and were led by Sheldyn Fisher (4th, 13:24), Mallory Taylor (10th 13:47), and Hannah Woroniak (13:58). On the boys’ side, Northwood also defeated Boynton. The Lakers were led by their big 3, Aidan Cox (1st 10:33), Porter Heigis (2nd, 10:50) and Luke Tkaczyk (4th, 10:57). All 3 had faster times than last year’s winner. Also scoring the Northwood and placing in the top 10 were Wyatt MacKey (6th, 11:29) and Tyler Tkaczyk (7th, 11:35). Strafford’s Lars Hogne was 8th in 11:52. Boynton had four runners in the top 10 with Josh Movessian, Landen Vaillancourt, Connor Traffie, and Gabe Turner. The girls’ JV race was easily won by Phillips Exeter, who placed their entire top 7 in the top 14 slots and boasted a 36 second pack time. They were led by Sydnee Goyer (2nd, 22:06) and Alexandra VanDijkum (3rd, 22:06). Kennett was second and was led by Zara Cheney who won the race in 21:46. In the boys’ JV race, Phillips Exeter took it our fast and were definitely winning the team competition through the mile. Coe-Brown, however, won all the battles over the second half of the course, including Jacob Spainhower holding off Joseph Bedell over the final hundred to win individually. The Bears would take the team title with 23 points. Spainhower was supported by Dawson Dubois (3rd, 18:29), Gavyn Auclair (5th, 18:51), Aidan Ahern (6th, 18:55), Riley Smith (8th, 18:57) Isaac Wells (9th, 19:04) and Sam Patteson (10th, 19:07). The girls’ varsity race was an extremely close see-saw battle resulting in only 13 points separating places 1-3. Immediately after, all knew it was a close one between Phillips Exeter (PEA), Bishop Guertin (NH-3), and Coe-Brown (NH-1). PEA would win ending Coe-Brown’s three year win streak and besting the host school by 5 points. Bishop Guertin, only 7 points behind Coe-Brown, almost came in and stole this one off the strength their top 3, all freshmen. The Lady Bears fought hard and had their 5 scorers in before PEA’s 5th, but it was not enough. Individually, it was BG’s Caroline Fischer and Bedford’s Leya Salis squaring off over the rolling hills of Black Bear. Fischer would pull away over the last mile to win in a new course record of 18:12! Note, this was Maegan Doody’s course record that she set last year! With this one performance, Fischer, only a freshman, certainly has to be considered a challenger to Jackie Gaughan in D1, but don’t be surprised to see Salis right in the thick of it! 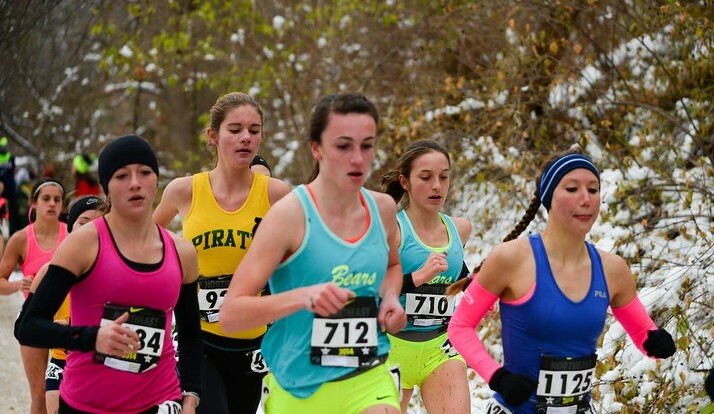 Rebecca Durham (Milford), Susan Poore (Windham), Alli Pratt (CBNA), Yoshiko Lynch (PEA), Danielle Slavin (OR), Leila Trummel (Hanover), and Caroline Towle (BG) rounded out the top 10. Overall the girls race saw 13 break the 20:00 barrier on this challenging rolling hills course in the woods! The boys’ varsity competition saw Coe-Brown (NH-3) make it 3 consecutive years as team champions by placing their top 5 before all teams’ 3rd runner. Coe-Brown employed a pack mentality to take the win 47-97 over Phillips Exeter. With a pack time of 31 seconds, CBNA placed all 5 scorers in the top 12. Junior Evan Tanguay (5th) led the Bears in 16:47. This race saw 8 break the 17:00 barrier. Atticus Stonestrom (Phillips Exeter) and Cameron Starr (Pelham) took this one out and battled through the trails in a competition that would not be settled until the single track where Stonestrom opened a small gap that Starr could not close to win 16:27 to 16:29. The patience of Mascenic’s Jake Movessian paid off as he placed 3rd in 16:43 just ahead of a hard-charging Aidan Sullivan (BG). Great day and great races in Northwood. The CBNA crew as always put on one of the best races in NH. Great MS racing, great HS racing. The best NH has to offer. Thank you for a great day of cross country! Next post 2016 Thetford’s Woods Trail Run!